Pictures: Please browse the selection here. There is a colour-enhanced aerial picture by John Douglas of the HMS Ganges site which shows the track on David Axford's site and a similar black & white aerial photo of the site on the HMS Ganges Association site. Please also browse the selection here. Descriptions of these photos are given below. 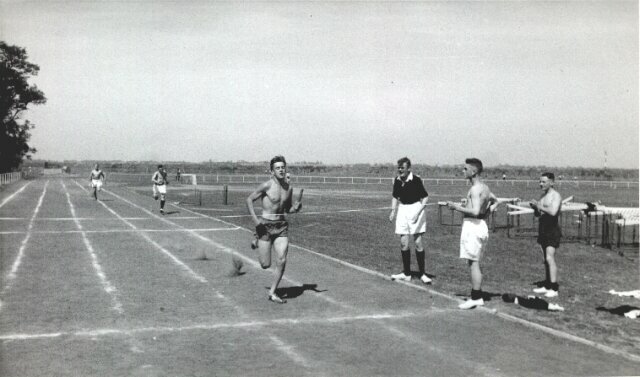 Rodney Division Sports Day 1955, pictures from Alan Johns: In the steeplechase Alan is the "boy" in front with the white horizontal stripe on his shirt and navy blue shorts. The guys lying down were splashing water on the runners. The boy second right in the spectator area with his shirt off is Alan's mate Ted "Brum" Palin who he is still in touch with. In the 100y sprint Alan is in front and won the race. In the group sitting down Alan is the boy holding the shot. HMS Ganges Sports Day 1956, pictures from Brian Lea. Benbow Division Sports Day 1959, pictures from David Morris: Graham Kington (Benbow Division) is shown winning the 4 x 440 yards relay, David is the person on the far right of the picture. The person in the water jump is one of the instructors, Petty Officer Anning, who was given an early bath by some of the trainees. Gollingwood Division Sports Day 1965, pictures from Brian Chester: Brian is the one receiving the prize. He is also third in the first lane in the line-up before the relay race which his team won. The 1950s shot of the track is courtesy of Brian Lea and the other undated one is from David Axford. There is a colour-enhanced aerial picture by John Douglas of the HMS Ganges site which shows the track on David Axford's site and a similar black & white aerial photo of the site on the HMS Ganges Association site. HMS Ganges was the land training establishment for recruits into the Royal Navy from 1905 until 1976. The track was built in 1938 and was surfaced with ashes from the boiler rooms and was 440 yards in length. The Eastern Counties Champs were held here in the 1960s and early 1970s but it is not known if it was ever altered to 400m. The track was next to the sea and there was a high bank to hold back the water. In the early 1990s the sports field on which the track was located was excavated to a depth of one fathom and the sea let in to form what is now the Marina.